I think I acquired my interest in fruit trees by following my Grandfather Ehrichs around evenings in the summer, in the "60s", while he gave each tree 5 gallons of water from his cistern. When I visited in the winter, my Grandmother would go to the storm cellar and get apples that she had wrapped in paper. She would peel them and we would watch Lawrence Welk or Bonanza on TV. I also grew up enjoying applesauce that mother made from apple trees that dad planted. The best apple sauce comes from the 2 MacIntosh trees, that are probably 50 years old now. An important part of any Orchard are the pollinators. A friend from Manilla provides honeybees and manages the hives each year. 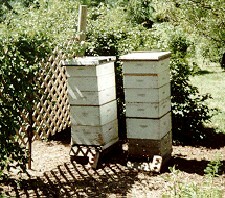 The 2 hives produced a couple of hundred pounds of honey in 1995. Sweetness is a key word in the orchard industry, honey and apple cider. 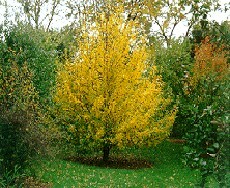 This is a fall view of a Turnball Oriental Pear. It is very resistant to fire blight, which most pear trees succumb to if not carefully managed and sprayed in a timely fashion. One major problem I have is in the fall during deer rut season. The buck destroy small trees by marking their territory and rubbing the velvet off their antlers, which breaks off branches and destroys the outer layer of bark. One solution I came up with is to place iron posts around the small trees and also wrap green plastic netting around the branches. I have a joke I tell hunters. 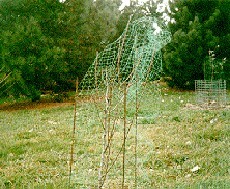 If they see a buck with a green hairnet on, it came from my apple trees.